Sama’i is a traditional instrumental genre in Arab and Turkish music. MESTO is presenting Sama’i Shadd Araban with a new arrangement that include, among other elements, solos for non-Middle Eastern instruments. The fourth section (khana) features a new melodic line in the style of chorale with woodwinds and celli simultaneously playing with the fast melody. 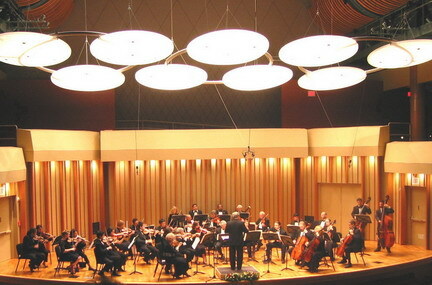 Due to the long-established nature of this form, the new arrangement was careful to take stylistic characterization into consideration and maintain taste and craftsmanship while setting ethnic music to a large orchestra. This composition was premiered in its new arrangement by MESTO in October 2002. The Shahnaz Longa by Ethemi is one of the most played instrumental pieces of the longa genre. Its structure is a representative of the form: a fast tempo in 3 clear sections with a repetitive part that is played between the sections. The composition is short but it serves the idea of exploring the different tonal centers of the maqam (musical mode). Originally composed as a string quintet (two violas) with percussion, this work was orchestrally expanded for the Mesto ensemble. It is reflective of Bulgarian folk instrumental and stylized vocal music. It takes advantage of the Bulgarians’ love of odd meters where the beats are of unequal length. he first section, beginning with a solo improvisation on viola, is in 7/16 meter. Melodically it first takes advantage of the warm resonance of the viola’s low strings before adding in the orchestra. The piece becomes harmonically dissonant before the 'vocal' section in 11/16. It concludes with a return to the opening melodies in 7/16. The music of the Sephardim is an amalgam of two distinct cultures: the Spanish/Jewish and the Moorish. In Spain Jewish composers borrowed from each other to create a new entity. Spanish/Moorish rhythms and Jewish melodies were combined to give to the world a delightful and refreshingly new musical sound. Picture in your mind's eye this unique joining of cultures, then listen and enjoy. Egypt started to open to westernization around the turn of the twentieth century and reached its peak in the thirties and forties. The Argentinean tango was one of the musical forms that Egyptian composers used. Farid el-Atrache composed and sang this tango that translates “In my imagination I see you as a rose.” It was well received and broadcasted all over the Middle East. MESTO is performing this tango with loyalty to the melody but in an instrumental style. This short masterpiece is one of ‘Abd al-Wahhab’s most recognized instrumental introductions. 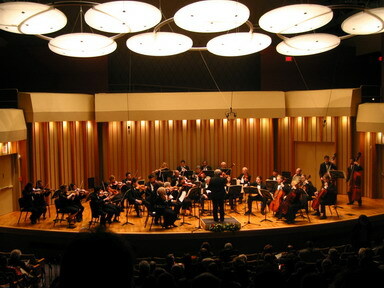 The opening solo for cello evokes a night scene on the river Nile while the sequential melody depicts the waves of the river. ‘Abd al-Wahab typically applied melodies that are either repeated or presented in a call and response style between the violin and the orchestra. The ‘ud solo at the end of the present piece is an interlude taken from the original song. Al-Nahr al-Khalid is often heard as an introduction in traditional Arabic concerts. This medley by the great Egyptian composer Muhammad ‘Abd al-Wahhab (1901-1991.) consists of three songs: Ashiq al-Ruh (the lover of the soul), Watani Habibi (beloved homeland) and al-Qamh (pronounce el-Amh: The wheat). The present medley uses the original instrumental introduction of the first song and the vocal parts of the second and third songs. It is worth mentioning that this rendition of Ashiq al-Ruh is entirely exclusive to MESTO. 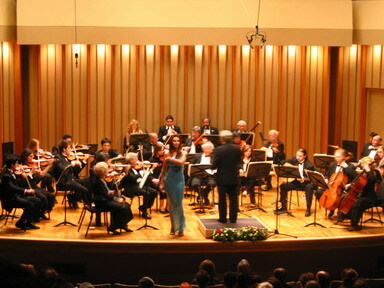 In 1987 Nabil Azzam performed it for Abd al-Wahhab himself at a UCLA reception on his violin accompanied by Mr. Jacque Kojyan on the piano and Mr. Pierre Bedrosian on the double-bass. Although it was performed by MESTO last year, many of our fans demanded a repeat performance. This is the world premiere of a magnificent work commissioned by MESTO for one of its premier members. The Celtic Fantasia is a new composition based on ancient Irish themes and written in a style unique to MESTO and its mission of reaching across cultures, continents and time to bring people together in a joyful, celebration of life and imagination. It calls up the ancient mythology of fairies and goblins with its mysterious opening, evoking images of mist covered mountains and the enchanted forests beneath. The fairies are joined by elves with a mixture of good and evil intent. You will hear the joyful introduction of some lively dance themes, but those give way to the breathy sound of the evil ones' whispers calling to the unsuspecting traveler in the sound of the strings randomly sliding their harmonics up and down the fingerboard. 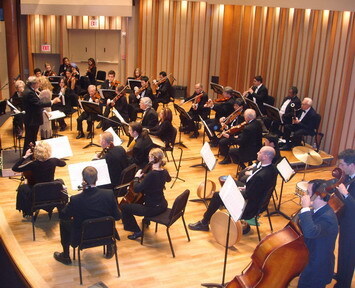 Finally, all is well as the entire orchestra breaks free into a rollicking reel, aptly named "Fairy Dance" whose origin is lost in time, but has been artistically rendered for MESTO by renowned composer, Stephanie Bennett. Laura Halladay is the multi-ethnic flutist who is featured in this piece conceived for her by maestro Azzam and brought to life by Stephanie Bennett. Please enjoy this first performance of what will likely become one of the mainstays of MESTO's burgeoning repertoire. Laura Halladay is the multi-ethnic flutist who is featured in this piece conceived for her by maestro Azzam and brought to life by Stephanie Bennett. The Greek composer Manos Hadjidakis began his musical career in Athens writing piano music. In 1946 he found his true vocation in writing for films, and was rewarded for his efforts with a 1960 Academy Award for his song "Never On Sunday." Many recording have been made of this haunting tune, with its traditional Greek rhythms and a simple but attractive melody, which speaks of a prostitute in Greece who refused to work on Sunday, her day of rest. The screen play for the film "Zorba the Greek" was adapted from a novel by Nikos Kazantzakis, with original music by Mikis Theodorakis. The score captures the essence of the movie and propelled its composer into international prominence. Although his studies at the Athens Conservatory prepared him for a career in music, it was his special interest in Greek folk music that gave him the creative spark to write the score to "Zorba". The main theme is used liberally throughout the film but the scene that captivates the audience is the one where Zorba teaches his English friend how to dance the syrtaki. It is here that the music and the character "Zorba" become one. --Arrangements of the following songs by Shelly Cohen. The romantic lyrics of this original song by Fairouz translate: “See how big is the ocean; See how vast is the sky? That’s how much I love you.” This song is representative of the Rahbani unique Lebanese style. The legacy of their style is well established and recognized not only in Lebanon but also throughout the Arab world. Nabil Azzam has a special and sensitive way of performing this repertoire on the violin specially, at Fairouz’s 70th Birthday.